Bradyville farmer Darrell Bussell has been irrigating his four acres of vegetable crops since rain stopped falling last month in Middle Tennessee. For most farmers, this wouldn't be a problem, except Bussell uses well water to quench his plants' thirst. "I'm worried about my well going dry," he said. "I've backed off on the water usage, but it's affecting the crops." Rainfall in Middle Tennessee is down 30 percent, or 7.85 inches below average, according to James LaRosa, a hydrologist with the National Weather Service in Nashville. "Since Jan. 1, we've been running about 70 percent of what we should have for precipitation," he said, adding the warm and dry spring created an earlier-than-normal demand for water from vegetation. LaRosa explained how rainfall during March, April and May creates better ground water and soil moisture conditions for summer and fall months. But without water, farmers struggle to keep their plants alive. 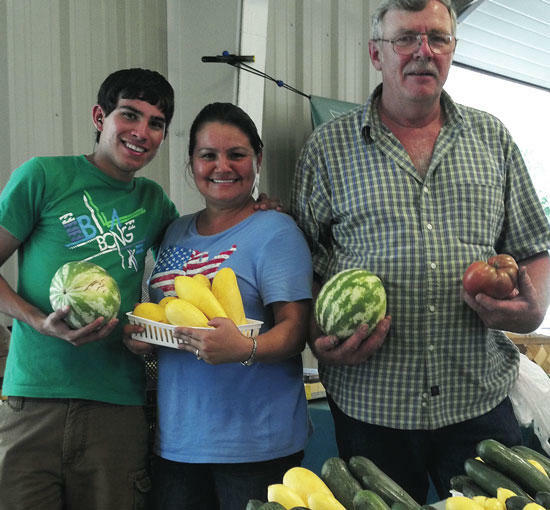 Bussell, along with his wife, Anacita, and son, Emanuel, were at the Rutherford County Farmers' Market Friday morning selling tomatoes, watermelon, peppers and squash. The selection was smaller than normal, and so was the produce. "The watermelon should be four times the size," he said. He has more veggies that need to be planted as part of his crop rotation, but without rain, they'll die. "I can't put them in the ground now because they'll burn up; it'll kill them," Bussell explained. Haskell Evans harvests about 50 acres of vegetables at his Gladeville farm. He can irrigate some crops, but others, like corn and tomatoes, span too far to be watered. "We've been this dry before; it's just never been this dry in June," he said. Evans said it pains him to see $20,000 worth of tomatoes lying on the ground, rotting. And his first round of corn is drying up in the fields. "If it was good enough, we could actually cut it for the cows, but most of it isn't even (mature)," he said. "We'll have to cut it and roll it as hay to feed the cows." The lack of rain has limited his harvest, which limits the amount of produce his can sell at the Rutherford County Farmers' Market. Prices are holding up, but who knows for how long, he says. Not only does the drought affect farmers and their crops, but also farm workers who count on harvesting crops for income. "To some extent, my labor bill hasn't been as much because we haven't had to pick as much," Evans said. "I really feel worse for them than I do for me because they depend on that for a job." He stressed the importance of consumers shopping for produce directly from farmers -- now more than ever. Several growers have been forced to pull out of the Rutherford County Farmers' Market because of the drought, according to Janie Becker, who manages the market. "We normally have blueberry growers who, by planting different varieties, can stretch out their production period from mid-June through the end of August," she said. "One of our regulars told me that his fruit are turning into 'raisins' while still on the plants and that he simply can't supply enough water to get the blueberries to mature normally. I suspect we'll see this in more and more crops if we don't get substantial rain soon and/or have another round of intensely hot weather this summer." Becker explained how this growing season has been one of mixed emotions for many growers in the mid-state. The warm winter and early-spring allowed many farmers to get a head start on transplanting seedlings to the fields and on direct planting of all sorts of crops. "For crops that mature quickly like summer squash and green beans, this was temporarily beneficial, as farmers had warm weather products available much earlier than usual," she said. On the other hand, Becker continued, the above average temperatures made many Tennessee strawberry producers have to change their schedules entirely. "They normally see a peak in production in mid-May, just as many farmers' markets are opening up," she said. "This year, the strawberry crop topped out around the third week of April, making some growers have to scramble to get their berries to consumers. Not only did they come earlier, but the overall production period was abbreviated." As the drought has worsened, more and more growers are forced to pay for municipal water sources, which carves out a substantial portion of their income from product sales. Because of this, customers can expect for prices on many crops, such as sweet and field corn to remain higher than usual due to the greatly reduced harvest this year as well as the increased production costs, Becker explained. "One of the few benefits of this dry weather is that we haven't been seeing as much damage from fungal diseases as usual," she said. "While there are always incidents of various blights reported, they have been much fewer this year." Farmers can look toward the skies for some immediate relief -- rain should be on its way, at least for a short while, says Nashville hydrologist James LaRosa. "We're fairly confident in some ran starting (today) and persisting through Tuesday, and even showers through the rest of the week," he said. A front is expected to push down, and with some of the moisture in the air, meteorologists are expecting more widespread shower activity. "There's a good chance that (most areas) might pick up at least an inch of rain," LaRosa said. "That's not enough to overcome drought, but it will help with some short-term issues. We need a lot more than that." As for Farmer Bussell, he'll do whatever it takes to keep his crops growing. "I'll keep watering until my well runs dry. And if it goes dry, I'll go get a big tanker and bring water in from the outside. This is my livelihood; I can't let it die."